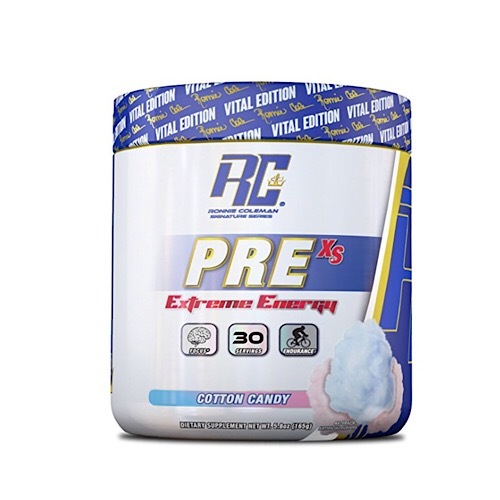 Ronnie Coleman Pre XS is an extreme energy pre workout that is made up of 7 ingredients and has been formulated to increase endurance and boost performance. It contains a good dose of caffeine for energy and includes citrulline malate to enhance muscle pumps. Pre XS also contains TeaCrine which has been clinically studied to boost mental and physical energy without jitters or crash while supporting a positive mood and motivation. Carnosyn beta alanine is another clinically studied ingredient shown to combat muscle fatigue while increasing athletic peak performance and supporting muscle recovery. Additionally, BioPerine is a scientifically studied absorption enhancer that increases the bioavailability of nutrients so that you can get the most out of your pre workout.